ASIN? ISBN? Self-Publishing terminology may seem like a weird foreign language to writers who haven’t run the gauntlet of publishing their books. But if you don’t know a blurb from a bleed—don’t worry! The experts at Self-Publishing Relief are ready to translate. 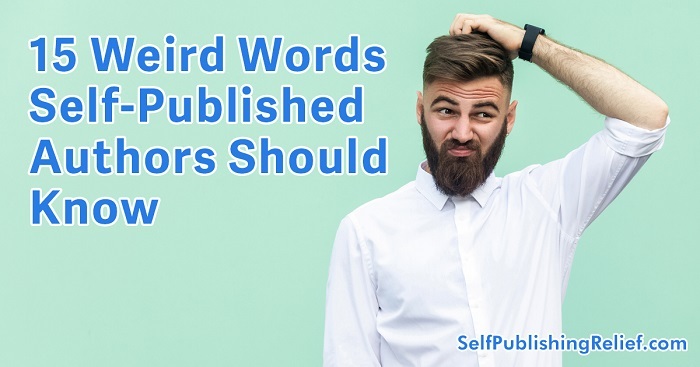 Here are some key terms you need to know if you’re ready to self-publish your book. ASIN: the abbreviation for Amazon Standard Identification Number. Although you may choose to assign an ISBN to the electronic versions of your book, it is not required that you do so. When you publish a Kindle version, Amazon assigns it an ASIN. Bleed: images or elements that extend beyond the trim line and leave no margin. When a page has bleed, it is printed on a larger sheet of paper and trimmed down. Blurb: a brief, enticing description of the book, which is usually found on the back cover or inside flap. Book trailer: the latest marketing trend in book promotion, a book trailer is a video that functions much like a movie preview. It’s designed to generate interest in a book and to entice potential readers into buying a copy. See examples of professional book trailers produced by the Self-Publishing Relief video team here. Color model: defines how colors will appear on paper or screen. The CMYK (cyan, magenta, yellow, black) model is subtractive, because in it the colored inks subtract brightness from the light background. The CMYK model is generally used for print work. The RGB (red, green, blue) model is additive; red, green, and blue light are added together in a variety of ways to produce a broad spectrum of colors. It is generally used for screen-based work. EPUB: the most common electronic book publishing format. A widely supported open standard maintained by the International Digital Publishing Forum, EPUB can display both reflowable and fixed-width content. Formatting: the process of putting a manuscript into a format that can be published in print or electronically. ISBN: the abbreviation for International Standard Book Number. An ISBN is a 13-digit number that uniquely identifies a specific edition of a book. Keyword: an important word or phrase assigned to a book on publishing platforms that is used by search engines and readers to locate certain genres, authors, or types of books. MOBI: Amazon-owned open electronic book publishing format, used for Kindle e-books. Like EPUB, MOBI can display both reflowable and fixed-width content. Nook: the e-reader developed by Barnes & Noble. Perfect binding: a method for binding softcover books by which the pages are attached at the spine with glue. Print on demand (POD): a digital printing technology in which copies of books are not printed until orders for them have been received. Proof: a copy of a text made for examination and correction. The term “galley proof” refers to a physical paper proof and comes from the days when printers would set pages into galleys—oblong metal trays into which type was fastened and from which copies were printed for proofreading. Galley proofs are most often produced in the proofreading and copy-editing review phases, while a proof made for final editing near the end of the process is called a page proof. These days the term “uncorrected proof” is used more commonly than “galley proof” and refers to the paper or digital proof version made for final approval by the author. Trim size: the size of a final printed page of a book after extra elements required in production have been trimmed off. Trim size should be chosen carefully, taking genre and market placement into consideration. Question: What are some other weird words used in self-publishing?